Nothing lasts forever, I suppose. In what could be construed as a cruel joke, Digg is pulling the plug on Digg Reader, the company’s answer to the demise of popular RSS service Google Reader. 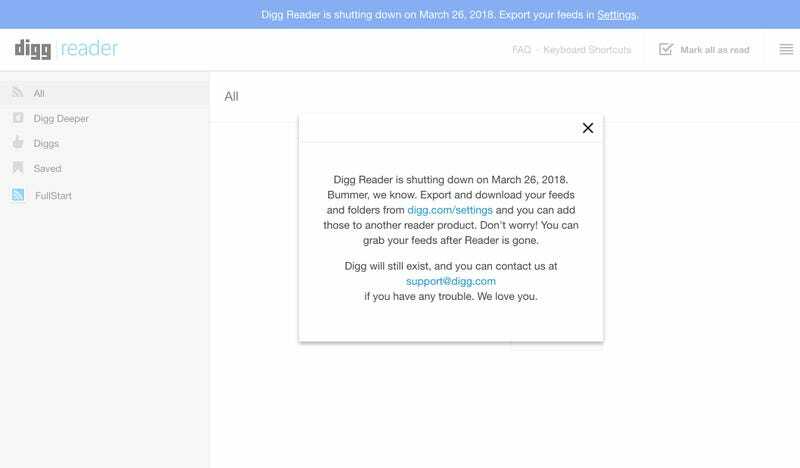 Digg Reader will shut down on March 26th, 2018, giving you just enough time to export your data before the service goes dark. If you’re not familiar with the story of Digg Reader, here’s a quick refresher: in 2013, Google announced it would be killing its beloved Google Reader, an RSS client with a devoted and surprisingly vocal following. In response, the recently revitalized Digg hatched a bold plan: It would create a product designed to replace the search giant’s RSS feed reader. Well, it’s been five years, and the promise of Digg Reader being forever by your side is now a memory, sun-bleached and inscrutable. Granted, before you get your bookmarks in a bunch, consider this: Were you even using it? We’ve reached out to Digg for more information regarding the shut down, but if you’re still a user of the Reader, we suggest you follow the site’s instructions: Sign in, export your data, and reminisce on the fond memories you had of your second-favorite RSS reader.